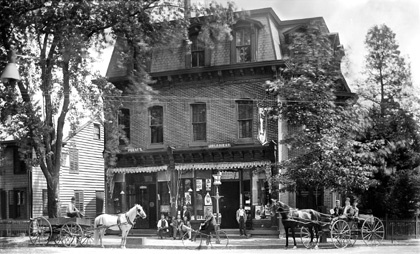 IN THE DAYS BEFORE TOWN TOPICS: The Town Topics building at 4 Mercer Street as it looked when carts and horses, not cars and parking meters, were the order of the day. After 54 years in the building previously occupied by Priest¹s Pharmacy, Town Topics has found a new home (see page 6 for a rendering of the new home). In 1950, Town Topics moved into the front office of a three-story brick building at 4 Mercer Street that had been previously occupied by Priest's Pharmacy. In spite of all the changes the Princeton community has gone through during those 54 years, it seemed that the Town Topics building would remain a constant. However, our landlord, Princeton University, has asked us to leave. The Princeton First Aid & Rescue Squad, citing increasing costs incurred from new equipment puchases and the maintenance of its 41-year-old facility, may look to start billing for service. The move would be a departure for the rescue squad, an organization that has long been a free service. Two employees of Princeton Young Achievers, an after-school program for at-risk youths, were arrested and arraigned last week in connection with the purchase of $6,600 in computer equipment and office supplies on an unauthorized credit card account.